In November 2012, Finance Minister Marie Carmelle Jean-Marie, who has since resigned, sounded the alarm about the state of public finances. She asked government officials to limit their spending, especially in non-essential travel. According to Senator Moïse Jean-Charles, former President René Préval left some $1.9 billion in the treasury when he stepped down in May 2011. But nobody knows how this large amount was spent. Furthermore, $150 million was earmarked for the reconstruction of the capital’s hilltop neighborhood of Fort National, which was devastated in the Jan. 12, 2010 earthquake. However, $50 million of that sum was diverted to build 3,000 houses in Morne à Cabri while the remaining $100 million has mysteriously disappeared. Under the government of President Michel Martelly and Prime Minister Laurent Lamothe, a great deal has been spent, but very little has been accomplished. Corruption has been the hallmark of the first two years of President Martelly’s government. Now, the president of the Senate’s Economy and Finance Commission, Sen. Jocelerme Privert, has laid bare the sad state of the country’s finances. A budget deficit of 9 billion gourdes [$211.805 million] is already forecast for the current fiscal year 2012-2013. According to the budget forecast, the state should collect 52 billion gourdes [$1.224 billion]. But for the first half of the fiscal year, the state only collected 21.7 billion gourdes [$510.684 million], despite an increase in payroll and income taxes. Therefore, there is already a deficit of 4.3 billion gourdes [$101.196 million]. During the same period in fiscal year 2011-2012, the state collected 22 billion gourdes [$517.744 million]. Meanwhile, the exchange rate continues to rise. Today, one needs 44 gourdes to buy one dollar, up from 39 gourdes in 2011, so the purchasing power of households has decreased significantly, despite an 8% increase in money transfers from the diaspora. Charles Castel, the Central Bank’s governor, says the inflation rate is 7.2%, but independent economists say it is closer to 10%. The Central Bank, also known as the Bank of the Republic of Haiti (BRH), has confirmed the budget deficit. However, Castel makes a difference between the revenue deficit, which is 9 billion gourdes [$211.805 million], and the fiscal deficit, which is 2.7 billion gourdes [$63.541 million]. Therefore, according to Castel, the deficit is less than 1% of the Gross Domestic Product (GDP). Castel also announced the issuance of $15 million from the state’s reserve money supply to try to stabilize the Haitian Gourde’s exchange rate. Despite the budget deficits, officials of the Martelly-Lamothe government continue to make a great number of unnecessary trips abroad, which entail hugely inflated per diem expense. For example, President Martelly gets travel expenses of up to $20,000 per day. Under previous governments, travel expenses were set at $600 per day for the highest ranking officials who needed to go to Europe, Africa, or Asia, and $500 per day for their travel in the Americas, while lower-level state officials received $300 to $400 per day, according to Sen. Jocelerme Privert, who spent many years working in different Haitian administrations. Meanwhile, the Senate’s Public Works and Communications Commission, led by Sen. Jean William Jeanty, issued a report that discovered corruption, embezzlement, and numerous other irregularities in the management of funds which the Martelly/Lamothe government illegally collected on international phone calls from June 2011 to November 2012. The report notes that National Council for Telecommunications (CONATEL), a regulatory body, collected $50.4 million during that period, but only 60% of the money – about $30 million – was sent to the Treasury. About 10% of the revenue – $ 5 million – was spent to purchase equipment to fight telecommunications fraud, and another $4 million was spent to hire the Swiss firm Société Générale de Surveillance S.A. (SGS) to improve security against fraud. Much of the money was spent on large unexplained expenses for “staff” salaries and bonuses. Sen. Jocelerme Privert said that according to the accounting that was available, CONATEL should have collected $69 million during this period. Furthermore, there is no law which authorizes the taxing of phone calls at 5 cents per call, nor the release of that revenue. Meanwhile, about $63 million was collected on incoming and outgoing money transfers (at $1.50 per transfer) for the period from Jun. 15, 2011 to Apr. 16, 2013. These funds were supposed to have been collected to finance the Program for Free and Compulsory Universal Schooling (PSUGO), which is also largely funded by the World Bank. This program has left a trail of corruption scandals from the National Palace through the Education Ministry all the way to schools themselves. 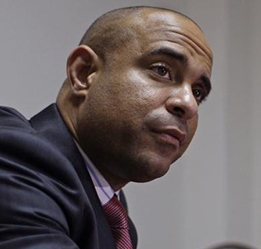 Following the release of the reports, the Senate summoned Lamothe to appear before it on May 28, 2013 in order to explain the irregularities in the expenditure of scarce state resources, including 5 billion gourdes [$117.67 million] spent on an emergency funds program for Hurricane Sandy last autumn. Seven senators signed the summons: Moïse Jean Charles Jean-Baptiste Bien-Aimé, Irvenson Steve Benoit, François Joseph Annick, Jean William Jeanty, Westner Polycarpe, and John Joel Joseph. As has happened before, the Prime Minister did not want to answer the senator’s questions and requested a postponement of the session until Friday, May 31, 2013, [which was postponed to June 4, 2013] despite the the senators’ strenuous objections. Meanwhile, President Michel Martelly, also on May 28, called members of the National Assembly to an extraordinary session to continue working on draft legislation. Most saw Martelly’s call for an extraordinary session to be a tactic to create a diversion from the attempt to convoke Lamothe. If the Prime Minister does not respect the senators’ summons or if they are not satisfied with his answers, will they unseat him? This question will be answered in the days ahead.